Digital signage software for communication agencies with Linutop! Linutop XS ➔ Small the size of a deck of cards, and silent because without a fan, it can hide behind any screen. Linutop 6 ➔ With the same characteristics as Linutop XS but more powerful. Once you've plugged in your players on your screens, you could also use the new service made by Linutop, Linutop TV that allows you to manage as many screens as you want through a web interface, no matter where they are located as long as they are connected to the Internet and to your Linutop.tv account, an essential management software that will save you precious time while being reactive on your advertising campaigns. The system can operate 24/7 and is specially designed to be a low energy system. Linutop mini-computers are ideal tools for streaming videos, viewing photos or any kind of documents, and more. As a digital display medium, they have several features. For example, it is possible to set the duration of each item to display and when to display it in the day, particularly effective for products that depend on weather or season for example. The Linutop digital signage solution is an ideal choice for communication professionals who intend to broadcast every day. 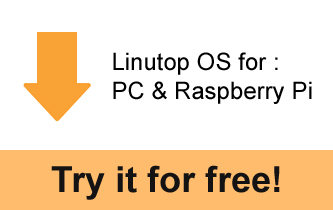 In addition, the Linutop operating system is available for PC and Raspberry Pi. It is available for free as download here ! If you already own a Raspberry Pi, you can turn it into a powerful digital signage display player by installing the Linutop operating system and plugging it into your screen. Finally, if you already have NEC screens, the Linutop operating system can now run on NEC screens "large screen Pxx4 and Vxx4" equipped with a Compute Module Raspberry Pi.